great book, very touching and emotional, i recommend it. I like how this book makes the characters like Steve and Mrs. Bixby feel like real people. Great book! I loved this book! It has a awesome start to it. Ms. Bixby’s Last Day was a good book. Liked how the book was from three different points of view. Awesome book lots of humor and action! The three boys had lots of fun and loved Ms. Bixby. This book was one of the best DCF books in my opinion. I liked how the book kept switching point of views. I recommend you read this book. 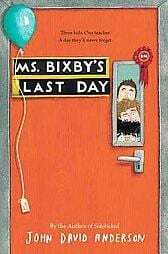 Mrs bixbys last day is very good for a young mind that is interested in realistic fiction!